Sheet metal & tempered components and so on. In addition to these, the shot blasting machine is used for pre-surface finishing for electroplating, rubberizing, zinc coating, plastic coating, and many more. Different types of shot blasting machines available with us includes tumblast shot blasting machines, table type shot blasting machines, hanger type shot blasting machines & continuous conveyor type shot blasting machines. All these shot blasting machine are ideal for small to medium sized components; on mass finishing basis where components are slowly tumbled on a conveyor belt and shot blasted. 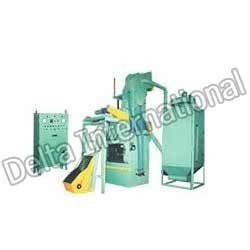 Looking for Shot Blasting Machine ?